The MA-1 flight jacket by Alpha has a 100% nylon satin outer shell. 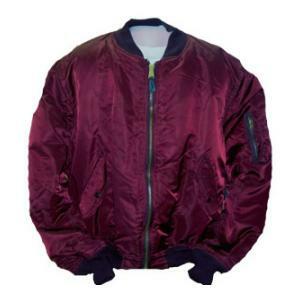 It has nylon lining and polyester batting interlining for warmth. The MA-1 flight jacket has a front closure storm flap. A knit collar, waist band and cuffs. It has a combination utility pocket on the sleeve. The MA-1 reverses to indian orange for use in emergencies. (This Alpha jacket runs small. Please purchase one size larger than you would normally wear in a standard jacket). US materials sewn overseas to military specs.